Scientists have proposed using the light pulse emitted by a quark gluon plasma, a newly discovered state of matter, as a way of measuring time at precise levels of yoctoseconds which is a septillionth of a second (1x10-24). A quark gluon plasma (QGP) is a new state of matter that results from the collision of two nuclei. It is made up of two of matters building blocks, the quark and the gluon. 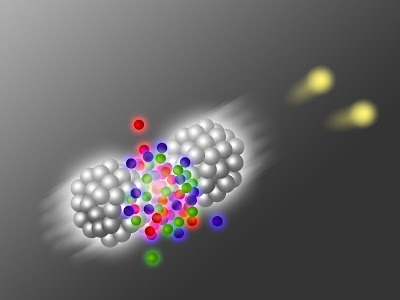 The image illustrates two lead atoms colliding to form a quark gluon plasma which in turn emits a short light pulse. Quarks are one of the tiniest building blocks of matter. The proton and neutron inside an atom are made up of these quarks. A particle made up of quarks is called a hadron. Particles made up of quarks are called hadrons. There are two different types of hadrons - baryons, such as protons or neutrons, are composed of three quarks, while other particles called mesons are made of a quark and an anti-quark. Gluons on the other hand are elementary particles, just like a quark, that acts as the exchange particles (or gauge bosons) for the strong force between quarks. When two nuclei (the nucleus is the dense region in the center of an atom comprising of of protons and neutrons) collide with each other, they transfer energy in the reaction zone. This energy is in the form of quarks and gluons, which strongly interact with each other. The resulting collision reaches a temperature of around 4 trillion degrees, hot enough to free the quarks and gluons from the colliding protons and neutrons. This freed up particles of quarks and gluons briefly form a state of matter called the quark gluon plasma. This state of matter only exists for a few yactoseconds (1x10-24). It is believed that a few moments after the Big Bang, all the matter in the whole universe was made up of this state of matter. On February 2010, scientists at the Brookhaven National Laboratory announced that they have created a quark-gluon plasma with an approximate temperature of 4 trillion degrees Celsius using two gold ions. CERN collider to become the world's fastest stopwatch? Heavy ion collisions at CERN should be able to produce the shortest light pulses ever created. This was demonstrated by computer simulations at the Vienna University of Technology. The pulses are so short that they cannot even be measured by today's technological equipment. Now, a method has been proposed to create the world's most precise stopwatch for the world's shortest light pulses, using a detector which is going to be installed at CERN in 2018. Phenomena taking place on very short time scales are often investigated using ultra short laser pulses. Today, pulse durations of the order of attoseconds (billionths of a billionths of a second, 10^-18 seconds) can be created. But these records could soon be broken: "Atomic nuclei in particle colliders like the Large Hadron Collider (LHC) at CERN or at Relativistic Heavy Ion Collider (RHIC) can create light pulses which are still a million times shorter than that", says Andreas Ipp from TU Vienna. In the A Large Ion Collider Experiment (ALICE) experiment at CERN, lead nuclei are collided almost at the speed of light. The debris of the scattered nuclei together with new particles created by the power of the impact form a quark-gluon plasma, a state of matter which is so hot that even protons and neutrons melt. Their building blocks – quarks and gluons – can move independently without being bound to each other. This quark-gluon plasma only exists for several yoctoseconds (1x10-24 seconds). From the quark-gluon plasma created in a particle collider, light pulses can be emitted, which carry valuable information about the plasma. However, conventional measurement techniques are much too slow to resolve flashes on a yoctosecond timescale. "That's why we make use of the Hanbury Brown-Twiss effect, an idea which was originally developed for astronomical measurements", says Andreas Ipp. In a Hanbury Brown-Twiss experiment, correlations between two different light detectors are studied. That way, the diameter of a star can be calculated very precisely. "Instead of studying spatial distances, the effect can just as well be used for measuring time intervals", says Andreas Ipp. The calculations he did together with Peter Somkuti show that the yoctosecond pulses of the quark-gluon plasma could be resolved by a Hanbury Brown-Twiss experiment. "It would be hard to do, but it would definitely be achievable", says Ipp. This experiment would not require any additional expensive detectors, it could be done with the "forward calorimeter", which is supposed to go on line at CERN in 2018. That way, the ALICE-experiment could become the world's most accurate stopwatch. There are still many open questions in quark-gluon plasma physics. It has an extraordinarily low viscosity, it is thinner than any liquid we know. Even if it starts out in a state of extreme disequilibrium, it reaches a thermal equilibrium extremely fast. Studying the light pulses from the quark-gluon plasma could yield valuable new information to better understand this state of matter. In the future, the light pulses could perhaps even be used for nuclear research. "Experiments using two light pulses are often used in quantum physics", says Andreas Ipp. "The first pulse changes the state of the object under investigation, a second pulse is used shortly after that, to measure the change." With yoctosecond light pulses, this well-established approach could be used in areas which up until now have been completely inaccessible to this kind of research.